In Orlando, the project benefitted The Center for Independent Living in Central Florida, an organization that has directly impacted more than 26,000 lives in the past 10 years by providing resources and accessibility options for people with disabilities. 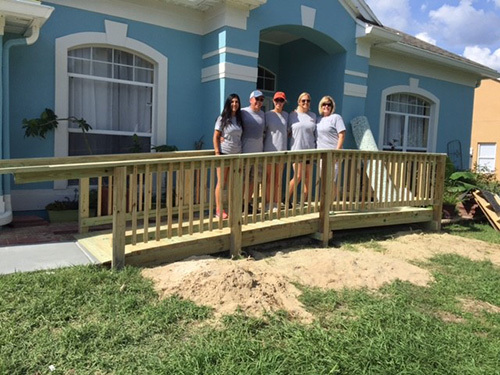 Approximately 70 Weekley team members from the company’s Orlando division joined with family members, vendors and homeowners to build six ramps for families in need. This project benefited deserving families by providing a ramp for clients, which will help them be able to leave their homes without assistance. The project included donations of more than $15,000 in materials and tools, as well as 740 volunteer hours. “It was so fun to come together as a team with Sales Consultants, Builders and managers to work side by side and accomplish something,” said Shane Richins, Builder for David Weekley Homes. Build Month: David Weekley Homes team members pose on one of the new ramps built for The Center for Independent Living in Central Florida.